Tacos are my 2nd favorite food of all time. Fried chicken comes first of course, but the versatility of a good taco just gets me going. So many sauces, cheeses, seasonings, and meats can be used to turn your little store bought taco kit into something completely different and delicious. Contrary to popular belief, taco seasoning is extremely simple. People tend to think taco seasoning is something that can only be bought in a package but you’re wrong my friend! I only make my own taco seasonings because if you read the back of those packets, there’s a million other ingredients detrimental to your health that are completely unnecessary when it comes to taste. So here’s my very simple taco seasoning! Good for about 1 1/2 – 2 pounds of any meat of your choice. You can always add more for taste. Looks too simple because IT IS. 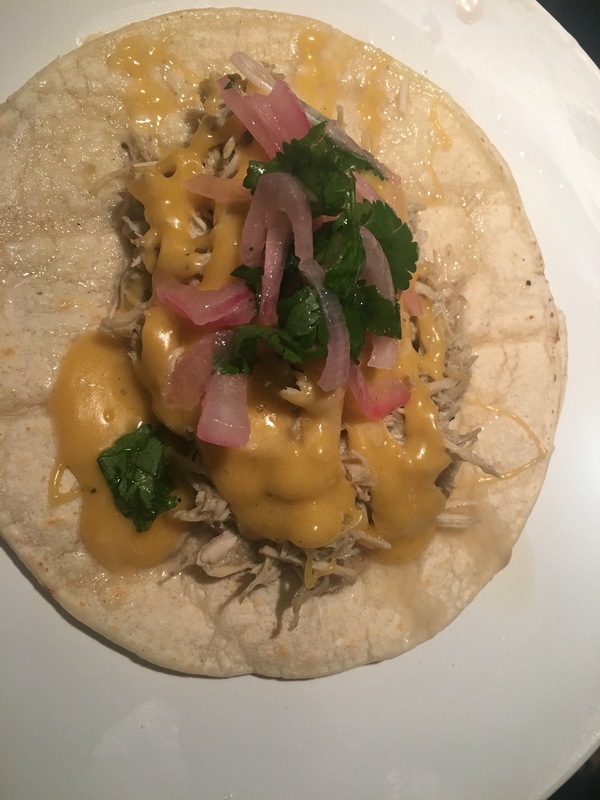 With these chicken tacos, I slow cooked my chicken for about 3 hours in a small 1.5 liter slow cooker. I started off by laying the chicken in the crockpot. I then added all my seasonings and poured 1 cup of warm water over the chicken. The water helps to maintain a moist chicken so it doesn’t dry out. Also, you’ll need the chicken broth for later, just wait. I set the chicken on high for 3 hours and didn’t touch it until it was time to make the sauce. 1 pack of sharp yellow cheddar cheese or you can freshly grate your own cheese. Take 1/2 cup of the chicken broth from your slow cooker that now has all the seasoning and flavor from the chicken slow cooking (YUM) and add it to a small sauce pan bringing it to a simmer. Once the chicken broth has started to bubble, add the cheese and bring down the heat. Stir constantly to avoid a big clump of cheese. Once the broth has disappeared, it’s time to add another 1/2 cup of the chicken broth. Keep stirring until you have a smooth cheesy sauce. Last step is adding the heat! Add 1 tsp of cayenne pepper seasoning. I like heat but I don’t like when it over powers the rest of the flavors so this one is subtle. Feel free to add more if you like more spice. Let the sauce rest on the stove over low heat so it doesn’t become solid. Add your spicy cheese sauce. Top with cilantro and red onions. I soaked my onions in lime juice and cilantro over night so if you wanna take the extra step go for it.